Gillian Glaes. 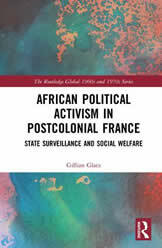 African Political Activism in Postcolonial France: State Surveillance and Social Welfare. Routledge, 2018.